A day after Bharat Bandh called by Dalit groups, now Non-Dalit groups targeted Dalit slums and set on fire two Dalit politicians’s houses. A mob of around 5000 people ransacked the houses of local Bharatiya Janata Party (BJP) MLA Rajkumari and former Congress MLA Bharosi Lal Jatav and burnt them in Hindaun town of Karauli district in eastern Rajasthan. They were not in town when their homes were attacked. Apparently, this was an avenge in respond to the alleged rampage done the protestors during the Bharat Bandh called by Dalit groups against an alleged dilution of the SC/ST (Prevention of Atrocities) Act. After burning the houses, the administration imposed curfew on Tuesday afternoon and internet connection was suspended. Reportedly, both houses were empty when they were set on fire. Despite prohibitory orders, a large number of people took out a march under the banner of a trader’s union, apparently to submit a memorandum to the district administration demanding action against people who vandalized shops during Bharat Bandh. “The march was a violation of prohibitory orders under section 144 of the Criminal Procedure Code clamped on Monday evening,” said Bharatpur inspector general of police Alok Vashishtha, who rushed to Hindaun with additional forces to the Hindustan Times. “The agitators pelted stones at the police and we had to lob tear gas shells to control them. 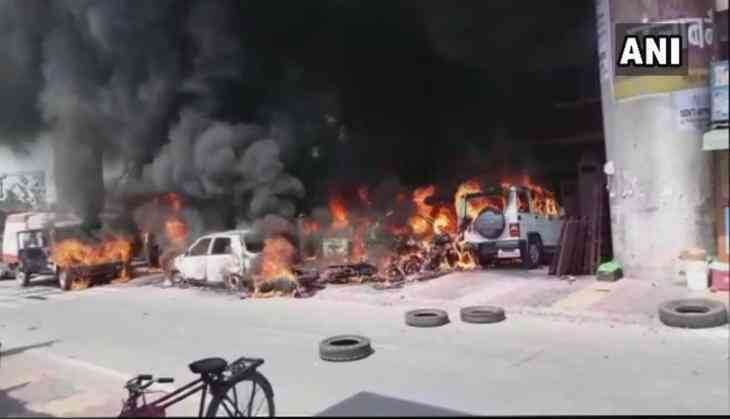 They burnt tyres in different parts of the town and tried to disturb the situation that had come under control after Monday’s violence,” the IG added. However, the march turned uncontrolled and asserted its way towards Dalit slums in the town. In response, the police have to crack down. “Police resorted to a lathi-charge to prevent them from attacking Dalits. Tear gas shells were also lobbed,” said Karauli additional superintendent of police Rajesh Yadav.